For other routes in the rest of Shropshire please visit Shropshire Councils Travel Shropshire Website. There are a large number of marked trails, footpaths, bridleways and tracks through woodland owned by The Forestry Commission. 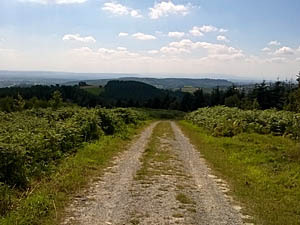 Three car parks serve as the starting point for the all the trails, forest roads and other footpaths. Cycling is permitted by the Forestry Commision on all forest roads. The landscape of the Forest is dominated by limestone ridges and can be fairly steep. The roads are generally gravel tracks so suitable bikes are neccesary. Vinnalls Car Park, marked A on map, is the starting point for the several trails, offers ample parking, picnic tables and a pop up tea room on Saturdays and Sundays. Pearce XC - 12.6km of descents and climbs. Built in partnership with Pearce Cycles of Ludlow. Downhill Trails - There are three downhill trails here for the experienced downhill rider. For more information please download the Trail Map of Hopton Wood or visit the Forestry Commission's Hopton Wood page. View Hopton Woods - Forestry Commission in a larger map. Pearce Cycles sell bicycles and accessories from their shop in Ludlow, Shropshire. They provide full servicing facilities in their workshop. IslaBikes are a specialist in the sale of Childrens Bikes. Clothing and accessories are also available. The UK's biggest dedicated road bike shop, set in a 12,500sq ft converted warehouse. Epic cycles offers bike sales, clothing and accessories.